Disney production has launched many animations who have great views from all over the world. The movies usually are loved by children, but teenager and adult also can watch them. Personally, until now, I love Disney movies, because they have great stories, eye-catching casts and easy-listened soundtrack. The stories that Disney make usually have great meanings for children to take the right path in living their life, so they can live happily ever after as same as the ending of every Disney movies. Furthermore, the casts whether they are animations or actor/actress are eye-catching. A handsome prince and a beautiful princess are surely one of the characteristics in Disney movies. Another characteristics that Disney movies have are soundtracks. Every Disney movies have great soundtracks that are related to the stories of the movies. We can see from the Lion King to Frozen. Who doesn’t like a song titled “Let it go” from Frozen? Everybody likes the song even many famous singers cover the songs with their own versions. Moreover, every countries sing the song with their own languages. The first time I heard the official "Let It Go" in Korean version, I totally in love with the song and I was curious with the song in Indonesian language. However, the song was not available in Indonesian language. What a pity I think. Not long after that, I heard the soundtrack of "Cinderella" movie titled "A Dream Is A Wish Your Heart Makes". It was sung by a beautiful Indonesian singer, Raisa. 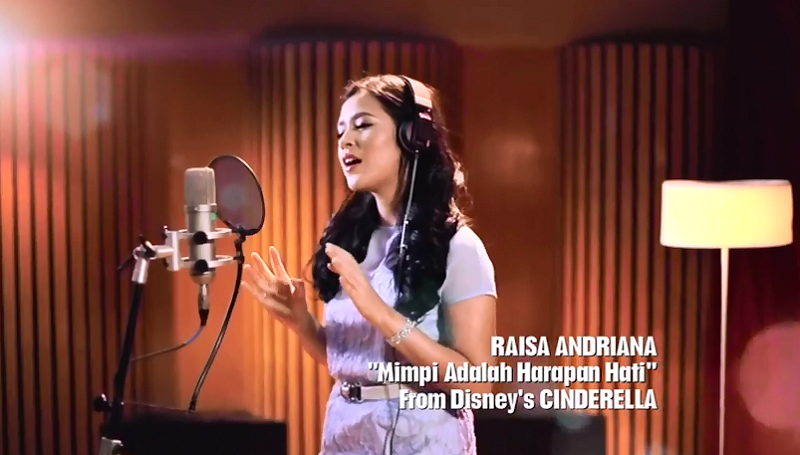 It was the first time that Indonesian singer sing a Disney song officially record by Disney. Not only Raisa who sings Disney songs which are officially records by Disney, but also there are another singers who also sing Disney songs. 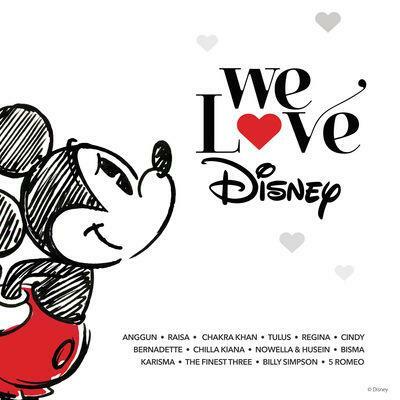 The songs that are sung by Indonesian singers are in an album titled “We Love Disney” special in Indonesian language. It was launched in 2015. Many famous Indonesian singer sing various Disney songs. The songs are the best songs in several movies, such as a song titled "Can’t You Feel The Love Tonight" from the Lion King, "Colors of The Wind" from Pocahontas, "A Whole New World" from Aladdin and many more. This album consists of 12 Disney’s songs and 12 various singers. The singers are Anggun, Regina Ivanova, Nowela, Raisa, Cakra Khan, Cindy Bernadette, Husein Alatas, 5Romeo, Bisma Kharisma, Chilla Kiana, Billy Simpson and The Finest Tree. Most of them are the finalist of the biggest talent shows, such as Indonesian Idol and X-Factor. At first, I expected high from this album, because this album was the first time for Indonesia to sing Disney’s songs. Moreover, when I heard Raisa sang a Cinderella’s song, I feel amazed. Her voice is really fit to the song. She succeed to bring Disney song without miss out the sense of Disney itself. Therefore, I was really interested in having this album and listening to all the songs. Otherwise, my expectation of this album is too high for the reality. I searched for the album desperately, and finally I have found them in some website which allows us to listening to the songs online. I was too excited and started to listen to the songs one by one. However, from 12 songs that I heard, I only like two of them. They are Mimpi Adalah Harapan (A Dream Is A Wish Your Heart Makes) by Raisa, Ayo Buat Boneka Salju (Do You Want To Build A Snowman) by 5Romeo. It made me down for a while, because I expected this album would be the best because the song lists are mostly my favourite songs from Disney. I know all songs in this album but when I heard the Indonesian version, FAIL. The singers in this album have great voice ever than other singers that Indonesia has. However, the feel that they sing does not reach audience’s heart. Therefore, when I listened to the songs, I felt nothing. I just listened to their singing. I don’t know what is wrong, but I think this album is not as good as the original version. However, I still appreciate for them and for the translation that make this album exist. Even though is not as good as my expectation but still I am proud to know that Indonesia also has "We Love Disney" album just like other countries. I hope Disney or music productions who produce songs that are originally from other countries can be as good as the original or even better from the original. Keep produce a masterpiece to prove to the world that Indonesia has many things to show.